Portland (31-46) was missing starters Zach Randolph, Joel Przybilla and rookie LaMarcus Aldridge to injury or other medical conditions. The team found out Monday that Aldridge’s rapid heartbeat he experienced nine days ago was caused by Wolff-Parkinson-White Syndrome. Here’s the news on the Portland Trail Blazer’s website. The former Longhorn standout was in his rookie season and contributing 9 points in 22 minutes while shooting better than 50% for the lowly Trail Blazers. So what was going on with LaMarcus? What is Wolf-Parkinson-White syndrome? (This is mostly for my own sake). 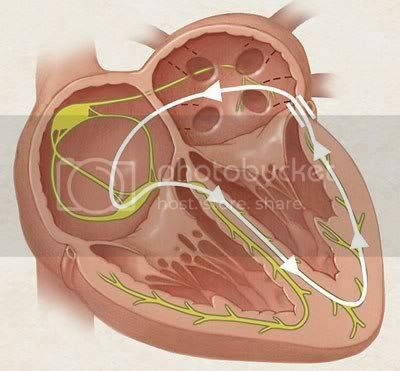 In a normal heart the pacemaker is the SA Node. What I mean is those are the first cells to fire. The electrical signal spreads across the atria (the upper two chambers of your heart) and causes them to contract. The signal reaches the AV Node. This can be thought of as the gate keeper to the ventricles (the lower two chambers of your heart). In WPW there is another pathway, not through the regular AV Node. In WPW it is typically (I think) an anatomically defined pathway called the Bundle of Kent. The normal pathway, through the AV Node, still exists. Typically the extra pathway allows quicker transmission of the electrical signal, which originated up in the SA Node. Remember, the AV Node is kind’ve the gatekeeper to the ventricles. The electrical signals move slower through it, and it can let fewer through. This has important implications for some of the risks with WPW. Patients with Wolf-Parkinson-White can develop re-entry tachycardia. While more complicated than this, it can basically be thought of that the electrical signal gets caught in “loop” between the normal pathway and the extra pathway, continually stimulating the ventricles more than they should be and causing them to contract quicker (causing the increased heart rate aka tachycardia). Beyond that threat other dysrhythmias are possible with WPW. The biggest risk is probably atrial fibrillation. In this condition, the SA Node basically is dysfunctional. The electrical impulses generated in the two atria are just insane and without organization. Because the different muscle fibers are getting electrical signals at different times, the atria don’t get a solid contraction but just kind’ve flutter around, with disorganized contractions in various areas. Atrial fibrillation causes the stagnation of blood in the atria which increases your risk of clots forming which can then say, head up the carotids and cause a stroke. But the real risk, is that all this crazy electrical activity going on reaches the ventricles. Normally the AV Node acts as gate keeper (and the pacemaker actually in this situation), and prevents the disorganized electrical activity from reaching the ventricles. But in WPW they can head down the extra pathway. And well…everyone has seen them shout out “V Fib” in the show ER. Ventricular fibrillation, which is what was described above, just in the ventricles, is well…an absolute positive emergency. The ventricles pump the blood to your body, when they stop having organized contractions, you are in serious trouble. This is what kills you in heart dysfunction. So WPW should be taken pretty seriously. While I was under impression you often treat merely the dysrhythmias and symptoms of WPW with drugs, the Trail Blazer’s press release says Aldridge had a successful procedure done. That was, almost without a doubt, a catheter ablation of the extra pathway. They literally funneled a catheter (as they would to say, put a stent into your coronary artery) up into his heart, near the pathway and used radio waves to kill the extra pathway. Hopefully that was successful and LaMarcus will be symptom free from here on out and be able to return to the Trail Blazers (it does mention he’s out for the season…which has like five games left).